There was a smattering of miners on Harvard's 100-best performing CEOs in the world. 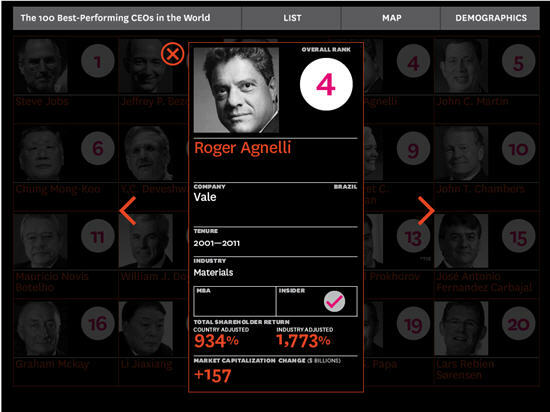 Vale's former CEO, Roger Agnelli, was the top miner and ranked fourth. He joined some heady company, coming in behind Apple's Steve Jobs, Amazon's Jeffrey Bezos and Samsung's Yun Jong-Yong. Agnelli earned the spot after helping shareholders to a 934% return during his 10-year tenure and a 157% market capitalization gain. The next miner coming in at 12th was William J. Doyle, the CEO of Potashcorp (NYSE:POT). Norilsk Nickel's Mikhail Prokhorov was 13th and Oscar Gonzalez Rocha, CEO of Southern Copper (NYSE:SCCO), was 45th. Harvard Magazine said the ranking was based on ". . . the long-term performance of each CEO, from the first day on the job to the last." Rankings were based upon total shareholder returns and increases in market capitalization. Agnelli was booted out of Vale (NYSE:VALE) by government shareholders in 2011 to more closely align the company with national interests.